Ah, Trap Hole: good old Trap Hole, the Staple of yore. Back in the day, every deck ran Trap Hole in threes. It wasn’t questionable; there was absolutely no reason not to. Trap Hole was nearly impossible to get rid of, and with all decks based on offense, Trap Hole was a necessity. Anyone who didn’t run Trap Hole was either just a rentsy idiot, or didn’t have one. Now, however, things have changed, and Trap Hole is sadly outdated. It’s a Normal Trap, non-chainable, and it’s restricted in its use in that you may only activate Trap Hole when your opponent summons a monster (and that doesn’t include Special Summoning) with 1000 ATK or more. So don’t try to Trap Hole that Raging Flame Sprite; it won’t work. Moreover, if your opponent summons, say, Tribe-Infecting Virus, he is allowed to use T-Virus’s effect one time before you may activate Trap Hole. The same goes for Cannon Soldier and similar monsters, I’m afraid. And in case anyone out there is still wondering, NO, you may NOT Trap Hole a Jinzo. Of course, Trap Hole isn’t that bad. You can get rid of that Airknight when he summons it, you can make sure that Bounder won’t bother you, and you can generally be extremely annoying. But there are better options. Torrential Tribute and Bottomless Trap Hole both surpass Trap Hole as far as playability goes, and the same argument could be made for Compulsory Evacuation Device and Sakuretsu Armor. Nevertheless, Trap Hole remains a decent option for anyone who can’t get his hands on those other cards; and there’s absolutely nothing wrong with it. The rating is lower in Advanced Format due to the increased number of Burners. Today’s card is Trap Hole, a card I feel is officially obsolete. Trap Hole destroys one monster Normal Summoned or Flipped Summoned by your opponent with an ATK equal to or greater than 1000. My question is why would you use this instead of Bottomless Trap Hole? Sure Trap Hole’s standards are 500 ATK points lower, but Bottomless Trap Hole works against Special Summoned monsters AND removes them from play. You could argue that Trap Hole works against more monsters than Bottomless Trap Hole, but who cares? I can’t think of many monsters that Bottomless Trap Hole can’t get to that you wouldn’t be able to get rid of in battle. There are exceptions to this but there aren’t enough for Trap Hole to win my heart. I feel I’ve said enough for today. I believe Warrior Decks and Mother Grizzly-Type monsters are the only reason you would ever use Trap Hole, but even then you’d probably be better off with Bottomless Trap Hole. Advanced Format: 1.5/5. I’ll give Trap Hole credit for being a Warrior killer, but that’s all it gets. Traditional Format: .5/5. Why you would use it in Traditional is beyond me. Art: 2/5. The monster has a name in the T.V. show but I can’t recall what it is. Now I remember, back in the day...if you didn't play 3 Trap Hole, you were a grade-A n00b. Now, if you play even 1, you're questioned as to why. But is Trap Hole REALLY that bad? No...but it's not that great either. 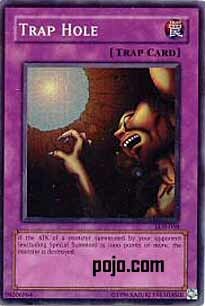 Trap Hole was the king of the 1-1 cards -- one of your cards to get rid of one of their cards and their summon for the turn. Most players don't play monsters in Attack position that have under 1,000 attack (except for Yata in Traditional, and Scientist in either format...), so getting to use this card on the turn after you set it was likely. But regarding Trap Hole on its own, there are just so many better traps. sHecKii hRmmm, the ever going debate on which card is better, Bottomless Trap Hole or Trap Hole. First let's compare and contrast (even though we probably already know the difference). Coin Flip NOTE: I apologize for my lack of performance over the past few weeks. If all goes well, I'll have another New Creed in eventually, but too much stuff has come up and I've not had access to a working computer for long enough to do enough work. I would reccomend that all of you go take a peek at Monday's review. It, along with Friday's card, were the two things that made me want to do this week. Basically, I like Tsukuyomi. It's a good card. And good karma to ExMoD for mentioning the "lock picker" - may you rip off twice as many kids this upcoming new year, scale four times the packs, and copy every good decklist conceivable. On with the review. Okay, for a shorter review today, we have Trap Hole. Last reviewed… 2002. Cough, huge metagame change… Well, on with the review. All of them are pretty interesting, and all three are rentsy choices for your deck. Let's take a look at them in a side by side comparison. Kills 1000 ATK or above, but fails to catch Mystic Swordsman LV2, some special monsters like Spirit Reaper, and all Special Summons. Kills 1500 ATK or above and catches Special Summons, but loses any monsters summoned with BELOW 1500 attack. No luck against that Spirit Reaper, Don Zaloog, Mystic Tomato, Shining Angel, or Marauding Captain. Kills on attack and is thus not limited to them summoning a card Kills 1 monster Kills any monster, but fails to catch cards like Breaker and Mobius like the Trap Holes can. Personally, I'd use all three, but where I'd use them depends on the deck. For example, if I'm using King Tiger Wang(hu), I wouldn't use Trap Hole because I've already covered the monsters with under 1500 attack save a few awkward 1450 attack monsters with no effect that no one uses. Bottomless Trap Hole instead. If I'm using some method of stall, though, Sakuretsu Armor is the best because I can't catch the cards like Marauding Captain or Mystic Swordsman with either Trap Hole, and they can slip under Messenger of Peace and Gravity Bind.